TO THE GLORY OF GOD, AND IN HONOURED MEMORY OF THE MEN OF THIS PARISH WHO FELL IN THE GREAT WAR. 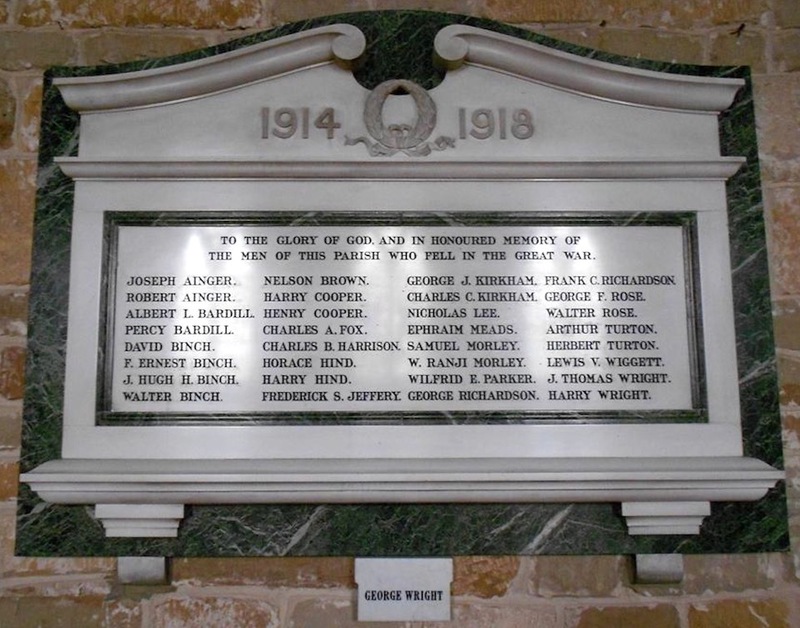 This plaque, to the men who perished in the Great War, is located in St Wilfrids Church. It is of white marble tablet with scrolled pediment, and the dates 1914 and 1918 set in raised numbers either side of a carved wreath in relief. Inscription is surrounded by a border of dark marble, matching the backing tablet. A small white marble tablet has been added directly underneath with one additional name (George Wright). It measures 1050mm height x 1800mm width. The total names on memorial: 33 - Served and returned: 0 - Died: 33. Information: Parents: Isaiah and Mary Ainger, of East Lodge, Sherwood Lodge, Arnold, Notts. It is likely that Joseph Ainger was entitled to the Victory medal, also called the Inter Allied Victory Medal. This medal was awarded to all who received the 1914 Star or 1914-15 Star and, with certain exceptions, to those who received the British War Medal. It was never awarded alone. These three medals were sometimes irreverently referred to as Pip, Squeak and Wilfred. Information: Parents: J. T. and Kate Bardill, of Georges Lane, Calverton, Notts. It is likely that Albert Bardill was entitled to the Victory medal, also called the Inter Allied Victory Medal. This medal was awarded to all who received the 1914 Star or 1914-15 Star and, with certain exceptions, to those who received the British War Medal. It was never awarded alone. These three medals were sometimes irreverently referred to as Pip, Squeak and Wilfred. It is very possible that Albert Bardill was entitled to the British War Medal for service in World War One. This British Empire campaign medal was issued for services between 5th August 1914 and 11th November 1918. The medal was automatically awarded in the event of death on active service before the completion of this period. It is likely that Robert Ainger was entitled to the Victory medal, also called the Inter Allied Victory Medal. This medal was awarded to all who received the 1914 Star or 1914-15 Star and, with certain exceptions, to those who received the British War Medal. It was never awarded alone. These three medals were sometimes irreverently referred to as Pip, Squeak and Wilfred. It is very possible that Robert Ainger was entitled to the British War Medal for service in World War One. This British Empire campaign medal was issued for services between 5th August 1914 and 11th November 1918. The medal was automatically awarded in the event of death on active service before the completion of this period. It is likely that Percy Bardill was entitled to the Victory medal, also called the Inter Allied Victory Medal. This medal was awarded to all who received the 1914 Star or 1914-15 Star and, with certain exceptions, to those who received the British War Medal. It was never awarded alone. These three medals were sometimes irreverently referred to as Pip, Squeak and Wilfred. It is very possible that Percy Bardill was entitled to the British War Medal for service in World War One. This British Empire campaign medal was issued for services between 5th August 1914 and 11th November 1918. The medal was automatically awarded in the event of death on active service before the completion of this period. It is likely that D Binch was entitled to the Victory medal, also called the Inter Allied Victory Medal. This medal was awarded to all who received the 1914 Star or 1914-15 Star and, with certain exceptions, to those who received the British War Medal. It was never awarded alone. These three medals were sometimes irreverently referred to as Pip, Squeak and Wilfred. ​It is very possible that D Binch was entitled to the British War Medal for service in World War One. This British Empire campaign medal was issued for services between 5th August 1914 and 11th November 1918. The medal was automatically awarded in the event of death on active service before the completion of this period. It is likely that F. Ernest Binch was entitled to the Victory medal, also called the Inter Allied Victory Medal. This medal was awarded to all who received the 1914 Star or 1914-15 Star and, with certain exceptions, to those who received the British War Medal. It was never awarded alone. These three medals were sometimes irreverently referred to as Pip, Squeak and Wilfred. It is very possible that F. Ernest Binch was entitled to the British War Medal for service in World War One. This British Empire campaign medal was issued for services between 5th August 1914 and 11th November 1918. The medal was automatically awarded in the event of death on active service before the completion of this period. Information: Parents: James and Mary Binch, of South Terrace, Calverton, Notts. The military decoration was awarded to Hugh Binch for acts of gallantry and devotion to duty under fire or for individual or associated acts of bravery which were insufficient to merit the Distinguished Conduct Medal. Conferment of the medal was announced in the London Gazette and Hugh Binch earned the right to add the letters M.M. to his name. It is likely that Hugh Binch was entitled to the Victory medal, also called the Inter Allied Victory Medal. This medal was awarded to all who received the 1914 Star or 1914-15 Star and, with certain exceptions, to those who received the British War Medal. It was never awarded alone. These three medals were sometimes irreverently referred to as Pip, Squeak and Wilfred. 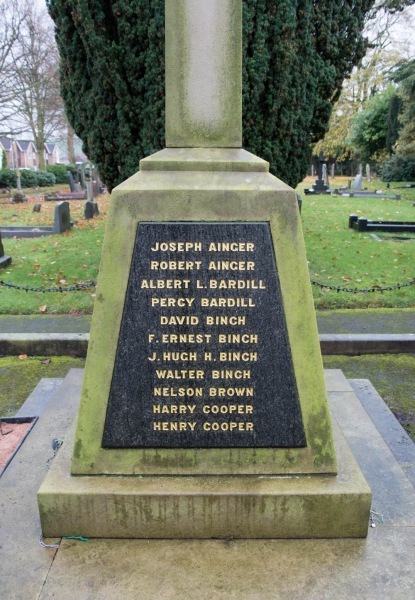 It is very possible that Hugh Binch was entitled to the British War Medal for service in World War One. This British Empire campaign medal was issued for services between 5th August 1914 and 11th November 1918. The medal was automatically awarded in the event of death on active service before the completion of this period. It is likely that Walter Binch was entitled to the Victory medal, also called the Inter Allied Victory Medal. This medal was awarded to all who received the 1914 Star or 1914-15 Star and, with certain exceptions, to those who received the British War Medal. It was never awarded alone. These three medals were sometimes irreverently referred to as Pip, Squeak and Wilfred. It is very possible that Walter Binch was entitled to the British War Medal for service in World War One. This British Empire campaign medal was issued for services between 5th August 1914 and 11th November 1918. The medal was automatically awarded in the event of death on active service before the completion of this period. It is likely that Nelson Brown was entitled to the Victory medal, also called the Inter Allied Victory Medal. This medal was awarded to all who received the 1914 Star or 1914-15 Star and, with certain exceptions, to those who received the British War Medal. It was never awarded alone. These three medals were sometimes irreverently referred to as Pip, Squeak and Wilfred. It is very possible that Nelson Brown was entitled to the British War Medal for service in World War One. This British Empire campaign medal was issued for services between 5th August 1914 and 11th November 1918. The medal was automatically awarded in the event of death on active service before the completion of this period. Information: Parent: John James Cooper. It is likely that Harry Cooper was entitled to the Victory medal, also called the Inter Allied Victory Medal. This medal was awarded to all who received the 1914 Star or 1914-15 Star and, with certain exceptions, to those who received the British War Medal. It was never awarded alone. These three medals were sometimes irreverently referred to as Pip, Squeak and Wilfred. It is very possible that Harry Cooper was entitled to the British War Medal for service in World War One. This British Empire campaign medal was issued for services between 5th August 1914 and 11th November 1918. The medal was automatically awarded in the event of death on active service before the completion of this period. Information: Parent: Mrs. Sarah Ann Binch, of Main St., Calverton, Notts. It is likely that Henry Cooper was entitled to the Victory medal, also called the Inter Allied Victory Medal. This medal was awarded to all who received the 1914 Star or 1914-15 Star and, with certain exceptions, to those who received the British War Medal. It was never awarded alone. These three medals were sometimes irreverently referred to as Pip, Squeak and Wilfred. It is very possible that Henry Cooper was entitled to the British War Medal for service in World War One. This British Empire campaign medal was issued for services between 5th August 1914 and 11th November 1918. The medal was automatically awarded in the event of death on active service before the completion of this period. It is very possible that Charles Alfred Fox was entitled to the British War Medal for service in World War One. This British Empire campaign medal was issued for services between 5th August 1914 and 11th November 1918. The medal was automatically awarded in the event of death on active service before the completion of this period. It is likely that Charles Brewster Harrison was entitled to the Victory medal, also called the Inter Allied Victory Medal. This medal was awarded to all who received the 1914 Star or 1914-15 Star and, with certain exceptions, to those who received the British War Medal. It was never awarded alone. These three medals were sometimes irreverently referred to as Pip, Squeak and Wilfred. It is very possible that Charles Brewster Harrison was entitled to the British War Medal for service in World War One. This British Empire campaign medal was issued for services between 5th August 1914 and 11th November 1918. The medal was automatically awarded in the event of death on active service before the completion of this period. Before the war he played for Surrey County Cricket Club. It is likely that Horace Hind was entitled to the Victory medal, also called the Inter Allied Victory Medal. This medal was awarded to all who received the 1914 Star or 1914-15 Star and, with certain exceptions, to those who received the British War Medal. It was never awarded alone. These three medals were sometimes irreverently referred to as Pip, Squeak and Wilfred. It is very possible that Horace Hind was entitled to the British War Medal for service in World War One. This British Empire campaign medal was issued for services between 5th August 1914 and 11th November 1918. The medal was automatically awarded in the event of death on active service before the completion of this period. 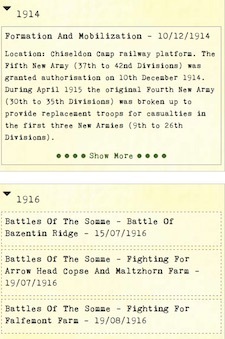 Information: Son of Francis and Elizabeth Hind, of Main Street, Calverton; Husband of Alice Maud Pinchbeck (formerly Hind), of The Pottery, Calverton, Nottingham. 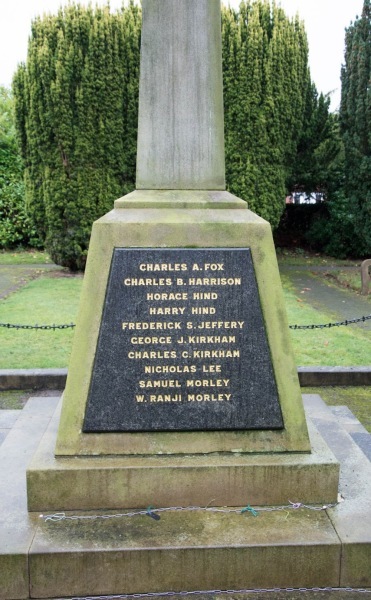 It is likely that Harry Hind was entitled to the Victory medal, also called the Inter Allied Victory Medal. This medal was awarded to all who received the 1914 Star or 1914-15 Star and, with certain exceptions, to those who received the British War Medal. It was never awarded alone. These three medals were sometimes irreverently referred to as Pip, Squeak and Wilfred. It is very possible that Harry Hind was entitled to the British War Medal for service in World War One. This British Empire campaign medal was issued for services between 5th August 1914 and 11th November 1918. The medal was automatically awarded in the event of death on active service before the completion of this period. Information: Husband of Mrs. D. Harpham (formerly Jeffrey). It is likely that Frederick Samuel Jeffrey was entitled to the Victory medal, also called the Inter Allied Victory Medal. This medal was awarded to all who received the 1914 Star or 1914-15 Star and, with certain exceptions, to those who received the British War Medal. It was never awarded alone. These three medals were sometimes irreverently referred to as Pip, Squeak and Wilfred. It is very possible that Frederick Samuel Jeffrey was entitled to the British War Medal for service in World War One. This British Empire campaign medal was issued for services between 5th August 1914 and 11th November 1918. The medal was automatically awarded in the event of death on active service before the completion of this period. Information: Parents: George and Elinor Kirkham, of Main St., Calverton, Nottingham. It is likely that George James Kirkham was entitled to the Victory medal, also called the Inter Allied Victory Medal. This medal was awarded to all who received the 1914 Star or 1914-15 Star and, with certain exceptions, to those who received the British War Medal. It was never awarded alone. These three medals were sometimes irreverently referred to as Pip, Squeak and Wilfred. It is very possible that George James Kirkham was entitled to the British War Medal for service in World War One. This British Empire campaign medal was issued for services between 5th August 1914 and 11th November 1918. The medal was automatically awarded in the event of death on active service before the completion of this period. Birth Town: Burton Joice, Nottinghamshire. Information: Son of George and Elinor Kirkham, of Main Street, Calverton, Nottingham. It is likely that Charles Clayton Kirkham was entitled to the Victory medal, also called the Inter Allied Victory Medal. This medal was awarded to all who received the 1914 Star or 1914-15 Star and, with certain exceptions, to those who received the British War Medal. It was never awarded alone. These three medals were sometimes irreverently referred to as Pip, Squeak and Wilfred. It is very possible that Charles Clayton Kirkham was entitled to the British War Medal for service in World War One. This British Empire campaign medal was issued for services between 5th August 1914 and 11th November 1918. The medal was automatically awarded in the event of death on active service before the completion of this period. It is likely that Nicholas Lee was entitled to the Victory medal, also called the Inter Allied Victory Medal. This medal was awarded to all who received the 1914 Star or 1914-15 Star and, with certain exceptions, to those who received the British War Medal. It was never awarded alone. These three medals were sometimes irreverently referred to as Pip, Squeak and Wilfred. Information: Eldest son of George and Mary Meads, of Burnor Pool, Calverton, Nottingham. It is likely that Ephraim Meads was entitled to the Victory medal, also called the Inter Allied Victory Medal. This medal was awarded to all who received the 1914 Star or 1914-15 Star and, with certain exceptions, to those who received the British War Medal. It was never awarded alone. These three medals were sometimes irreverently referred to as Pip, Squeak and Wilfred. 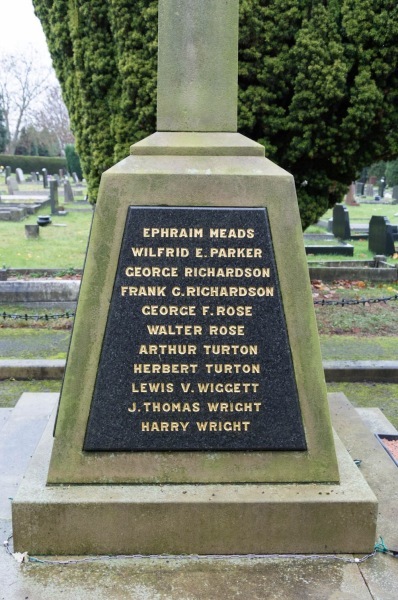 It is very possible that Ephraim Meads was entitled to the British War Medal for service in World War One. This British Empire campaign medal was issued for services between 5th August 1914 and 11th November 1918. The medal was automatically awarded in the event of death on active service before the completion of this period. It is likely that Samuel Morley was entitled to the Victory medal, also called the Inter Allied Victory Medal. This medal was awarded to all who received the 1914 Star or 1914-15 Star and, with certain exceptions, to those who received the British War Medal. It was never awarded alone. These three medals were sometimes irreverently referred to as Pip, Squeak and Wilfred. 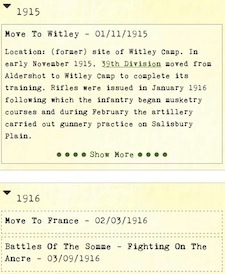 It is very possible that Samuel Morley was entitled to the British War Medal for service in World War One. This British Empire campaign medal was issued for services between 5th August 1914 and 11th November 1918. The medal was automatically awarded in the event of death on active service before the completion of this period. Information: Parents: Nathan and Hannah Morley, of Grocock's Yard, Calverton, Nottingham. It is likely that Wilfred Morley was entitled to the Victory medal, also called the Inter Allied Victory Medal. This medal was awarded to all who received the 1914 Star or 1914-15 Star and, with certain exceptions, to those who received the British War Medal. It was never awarded alone. These three medals were sometimes irreverently referred to as Pip, Squeak and Wilfred. 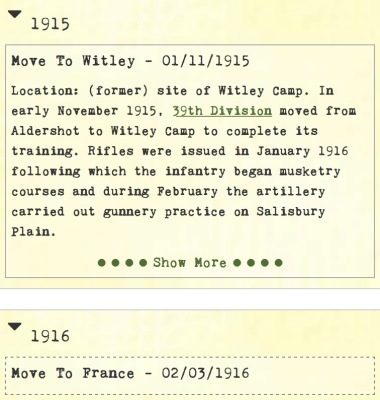 It is very possible that Wilfred Morley was entitled to the British War Medal for service in World War One. This British Empire campaign medal was issued for services between 5th August 1914 and 11th November 1918. The medal was automatically awarded in the event of death on active service before the completion of this period. It is likely that Wilfrid Ernest Parker was entitled to the Victory medal, also called the Inter Allied Victory Medal. This medal was awarded to all who received the 1914 Star or 1914-15 Star and, with certain exceptions, to those who received the British War Medal. It was never awarded alone. These three medals were sometimes irreverently referred to as Pip, Squeak and Wilfred. It is very possible that Wilfrid Ernest Parker was entitled to the British War Medal for service in World War One. This British Empire campaign medal was issued for services between 5th August 1914 and 11th November 1918. The medal was automatically awarded in the event of death on active service before the completion of this period. It is likely that G Richardson was entitled to the Victory medal, also called the Inter Allied Victory Medal. This medal was awarded to all who received the 1914 Star or 1914-15 Star and, with certain exceptions, to those who received the British War Medal. It was never awarded alone. These three medals were sometimes irreverently referred to as Pip, Squeak and Wilfred. It is very possible that G Richardson was entitled to the British War Medal for service in World War One. This British Empire campaign medal was issued for services between 5th August 1914 and 11th November 1918. The medal was automatically awarded in the event of death on active service before the completion of this period. Information: Parents: Arthur and Jane Richardson, of Terry Nook, Calverton, Nottingham. It is likely that Frank Cyril Richardson was entitled to the Victory medal, also called the Inter Allied Victory Medal. This medal was awarded to all who received the 1914 Star or 1914-15 Star and, with certain exceptions, to those who received the British War Medal. It was never awarded alone. These three medals were sometimes irreverently referred to as Pip, Squeak and Wilfred. It is very possible that Frank Cyril Richardson was entitled to the British War Medal for service in World War One. This British Empire campaign medal was issued for services between 5th August 1914 and 11th November 1918. The medal was automatically awarded in the event of death on active service before the completion of this period. It is likely that George Frank Rose was entitled to the Victory medal, also called the Inter Allied Victory Medal. This medal was awarded to all who received the 1914 Star or 1914-15 Star and, with certain exceptions, to those who received the British War Medal. It was never awarded alone. These three medals were sometimes irreverently referred to as Pip, Squeak and Wilfred. It is very possible that George Frank Rose was entitled to the British War Medal for service in World War One. This British Empire campaign medal was issued for services between 5th August 1914 and 11th November 1918. The medal was automatically awarded in the event of death on active service before the completion of this period. It is likely that Walter Rose was entitled to the Victory medal, also called the Inter Allied Victory Medal. This medal was awarded to all who received the 1914 Star or 1914-15 Star and, with certain exceptions, to those who received the British War Medal. It was never awarded alone. These three medals were sometimes irreverently referred to as Pip, Squeak and Wilfred. It is very possible that Walter Rose was entitled to the British War Medal for service in World War One. This British Empire campaign medal was issued for services between 5th August 1914 and 11th November 1918. The medal was automatically awarded in the event of death on active service before the completion of this period. Information: Husband of the late Elizabeth Turton (nee Burton). It is very possible that Arthur Turton was was awarded the 1914-15 star campaign medal of the British Empire for his service in World War One. It is likely that Arthur Turton was entitled to the Victory medal, also called the Inter Allied Victory Medal. This medal was awarded to all who received the 1914 Star or 1914-15 Star and, with certain exceptions, to those who received the British War Medal. It was never awarded alone. These three medals were sometimes irreverently referred to as Pip, Squeak and Wilfred. It is very possible that Arthur Turton was entitled to the British War Medal for service in World War One. This British Empire campaign medal was issued for services between 5th August 1914 and 11th November 1918. The medal was automatically awarded in the event of death on active service before the completion of this period. It is likely that Herbert Turton was entitled to the Victory medal, also called the Inter Allied Victory Medal. This medal was awarded to all who received the 1914 Star or 1914-15 Star and, with certain exceptions, to those who received the British War Medal. It was never awarded alone. These three medals were sometimes irreverently referred to as Pip, Squeak and Wilfred. It is very possible that Herbert Turton was entitled to the British War Medal for service in World War One. This British Empire campaign medal was issued for services between 5th August 1914 and 11th November 1918. The medal was automatically awarded in the event of death on active service before the completion of this period. It is likely that Lewis Victor Wiggett was entitled to the Victory medal, also called the Inter Allied Victory Medal. This medal was awarded to all who received the 1914 Star or 1914-15 Star and, with certain exceptions, to those who received the British War Medal. It was never awarded alone. These three medals were sometimes irreverently referred to as Pip, Squeak and Wilfred. It is very possible that Lewis Victor Wiggett was entitled to the British War Medal for service in World War One. This British Empire campaign medal was issued for services between 5th August 1914 and 11th November 1918. The medal was automatically awarded in the event of death on active service before the completion of this period. Information: Husband of Lucy Barks (formerly Wright), of 1, Cauldwells Yard, Sherwood St., Warsop, Mansfield. It is very possible that John Thomas Wright was entitled to the British War Medal for service in World War One. This British Empire campaign medal was issued for services between 5th August 1914 and 11th November 1918. The medal was automatically awarded in the event of death on active service before the completion of this period. It is likely that Harry Wright was entitled to the Victory medal, also called the Inter Allied Victory Medal. This medal was awarded to all who received the 1914 Star or 1914-15 Star and, with certain exceptions, to those who received the British War Medal. It was never awarded alone. These three medals were sometimes irreverently referred to as Pip, Squeak and Wilfred. It is very possible that Harry Wright was entitled to the British War Medal for service in World War One. This British Empire campaign medal was issued for services between 5th August 1914 and 11th November 1918. The medal was automatically awarded in the event of death on active service before the completion of this period. Information: HUSBAND OF GLADYS EVELYN WRIGHT, OF 187, MANSFIELD RD., DAYBROOK. It is likely that G H Wright was entitled to the Victory medal, also called the Inter Allied Victory Medal. This medal was awarded to all who received the 1914 Star or 1914-15 Star and, with certain exceptions, to those who received the British War Medal. It was never awarded alone. These three medals were sometimes irreverently referred to as Pip, Squeak and Wilfred. It is very possible that G H Wright was entitled to the British War Medal for service in World War One. This British Empire campaign medal was issued for services between 5th August 1914 and 11th November 1918. The medal was automatically awarded in the event of death on active service before the completion of this period. Also killed, during World War I, but not commemorated on any memorial​. Information: Parents: Joseph and Annie Richardson, of Calverton, Nottingham. It is likely that John Richardson was entitled to the Victory medal, also called the Inter Allied Victory Medal. This medal was awarded to all who received the 1914 Star or 1914-15 Star and, with certain exceptions, to those who received the British War Medal. It was never awarded alone. These three medals were sometimes irreverently referred to as Pip, Squeak and Wilfred. ​Eligibility for this award consisted of having been mobilised, fighting, having served in any of the theatres of operations, or at sea, between midnight 4th/5th August, 1914, and midnight, 11th/12th November, 1918. Women who served in any of the various military organisations in a theatre of operations were also eligible. It is very possible that John Richardson was entitled to the British War Medal for service in World War One. This British Empire campaign medal was issued for services between 5th August 1914 and 11th November 1918. The medal was automatically awarded in the event of death on active service before the completion of this period. Information: Parents: the late John and Margaret Allwood. It is likely that Herbert Allwood was entitled to the Victory medal, also called the Inter Allied Victory Medal. This medal was awarded to all who received the 1914 Star or 1914-15 Star and, with certain exceptions, to those who received the British War Medal. It was never awarded alone. These three medals were sometimes irreverently referred to as Pip, Squeak and Wilfred. It is very possible that Herbert Allwood was entitled to the British War Medal for service in World War One. This British Empire campaign medal was issued for services between 5th August 1914 and 11th November 1918. The medal was automatically awarded in the event of death on active service before the completion of this period. It is likely that Bertie Binch was entitled to the Victory medal, also called the Inter Allied Victory Medal. This medal was awarded to all who received the 1914 Star or 1914-15 Star and, with certain exceptions, to those who received the British War Medal. It was never awarded alone. These three medals were sometimes irreverently referred to as Pip, Squeak and Wilfred. It is very possible that Bertie Binch was entitled to the British War Medal for service in World War One. This British Empire campaign medal was issued for services between 5th August 1914 and 11th November 1918. The medal was automatically awarded in the event of death on active service before the completion of this period. 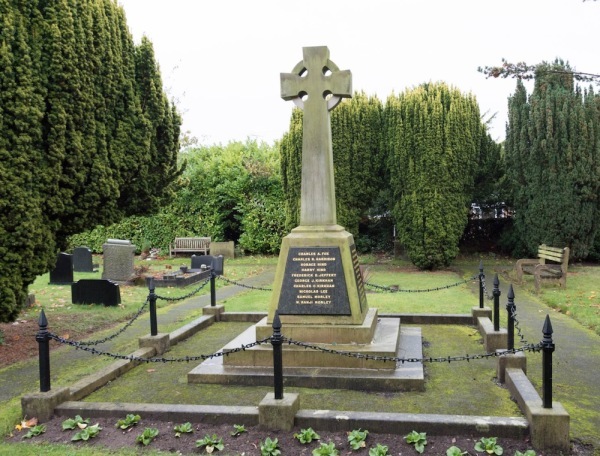 Situated in Mansfield Lane Cemetery, you will find the main commemorative memorial for all soldiers who sadly never returned from their stint at war.